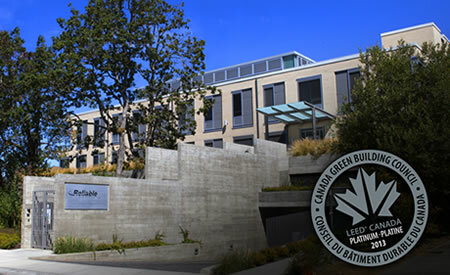 Reliable Controls is pleased to announce the achievement of LEED Platinum certification of the Reliable Controls Headquarters Annex in Victoria, BC. Green buildings are designed using an integrated team approach to save energy, use less water, and create less waste during construction and operation, providing an elevated level of indoor comfort. By implementing this well-rounded, holistic approach, a green building provides enduring social, environmental, and economic benefits. "We are very excited to be awarded LEED Platinum certification, the highest level achievable," said Tom Zaban, EVP Sales & Marketing. "The Reliable Controls Headquarters Annex is a demonstration of our collective commitment to sustainability and resilience, and effectively demonstrates leadership in our own field, showing we can work together to implement a reality that minimizes pollution, waste, and provides a lasting benefit to our community." The Reliable Controls Headquarters Annex facility, which houses Research & Development, Sales & Marketing, and Administration departments, includes design elements such as rain gardens and planters, swales, green roofs, cisterns, and trees – all of which preserve and enhance the natural, surrounding landscape. Prior to redevelopment, the site's stormwater drained through the municipal storm drain system without treatment; however, as a direct result of the new construction, stormwater runoff has been reduced by 52% and potable water for building sewage conveyance has been reduced by 82%. Overall, the building consumes 60% less potable water than a baseline building. The naturally vented building design relies on 57 trickle vents and hydronic heating and cooling to keep the occupants thermally comfortable and the overall energy consumption low. Lighting consists of modulating florescent fixtures with wireless control and daylight harvesting, as well as LED lighting. The facility achieves a 54% reduction in design energy costs compared to conventional standards. BACnet integration of the HVAC, lighting, and security systems allows occupied comfort settings to be enabled, maximizing energy savings. Individual control of temperature, light, sunshades, and occupancy is provided via LAN or wireless access. The measurement, verification, and controllability of the mechanical and electrical systems are a critical aspect in the design and operation of a sustainable building and as a result, Reliable Controls is uniquely positioned to deliver long-term solutions to these important sustainability requirements.